Sometimes, you actually have to put something somewhere so that you can find out that it’s in the wrong place. If you follow the permaculture design process as laid out by Patrick Whitefield, you go through five stages (base map, site survey, questionnaire, evaluation and design proposal) before you get the chance to put a plant in the ground. And then it’s in the wrong place … how did that happen? I accept the possibility that I’m incompetent, a second-grade permaculturalist or an under-skilled designer. Or maybe it’s just part of the learning process and I’ll make fewer mistakes the more I design and perhaps even the experts still make mistakes but their gentle egos prevent them telling us. Fin, bref, we’ve got some trees in the wrong place. As our forest garden plan evolves, we have changed the position of several trees. 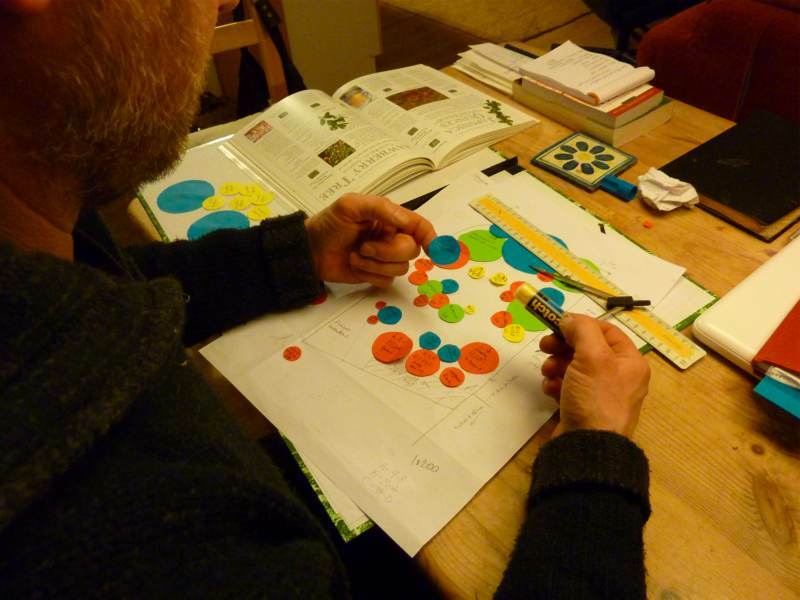 At this stage of the design process, still on paper, changing things is allowed. In Creating a Forest Garden: Working with Nature to Produce Edible Crops Martin Crawford recommends that we “keep the design on the go for several months, perhaps only coming back to it for a few minutes from time to time.” The photo shows me “moving a tree” with just my fingertips; you can see that this is the ideal stage to move trees. 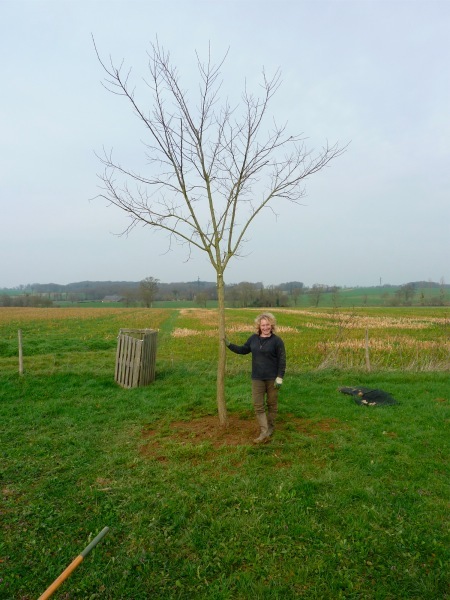 We’d planted a pair of false acacias (also called black locust, Latin robinia pseudoacacia) to frame an entrance onto our property but didn’t at first realise how large a tree they become and how quickly they grow. They were sucking water and nutrients from beneath a living willow fence/hedge we’ve planted and, as the “fedge” comes into leaf again, we can see the effect on those rods nearest the tree. So that tree had to go and as the forest garden design calls for one, we thought of “treecycling” it. 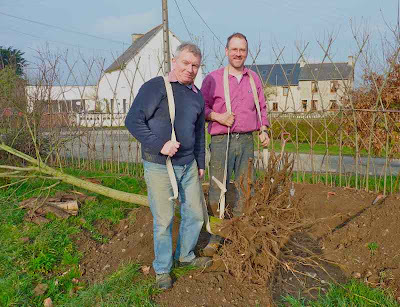 Now you don’t have to have read Robert Kourik’s Roots Demystified to guess that a big tough tree—especially a pioneering, quick growing one—has big tough roots. Quite frankly, it was a b****** to dig out. But a young tree is no match for a determined man with a long sharp spade and a bilingual lexicon of swear words to help him along and, as the air turned blue, out it came. I asked neighbour Robin to give me a hand and, with Gabrielle on the lighter end and in charge of steering, we walked it into the field of pasture that will become our forest garden and plopped it into a big hole I’d dug earlier. 5ft 2ins Gabrielle helpfully adds scale to the photo of the repositioned tree. For any of you who’d like to learn a few French swearwords (gros mots) to help when moving trees, I’d recommend working on a building site for a few days, although I’m not sure that the straw bale house build where I learned mine necessarily implies that they’re environmentally friendly cusses. A great post... Enjoyed your references to french swearing, very humorous. Even though I saw that photo of you 'moving a tree' in your plan, I like to imagine it as in an old war film when the general is pushing rounds the troops on a tap of the battle field! Both our rabbits and shee have eaten small amounts of leaves and seed pods without any ill effects but it was never intended to be a large part of their diet. I would love to know what is the alleged poisonous agent and how it acts; any plant scientists reading, please leave a comment. Yes indeed, remember Dunkirk, that's what I say! I can completely relate to the trees (I planted) in the wrong place problem. And because I have been lurking, profiting from, and thoroughly enjoying your blog for quite awhile, I thought the least I could do would be to tell you that i am a whole hearted fan and invite you for many pints of beer if you are ever anywhere near Berlin. Ash is ok as is hazel. Avoid elder too as can cause problems. All trees and bushes that are browseable can bring their own problems which is one of the reasons I stick to native species. It's always reassuring to hear that we're not the only ones making the odd mistake as we learn. We have no immediate plans to travel to Berlin but I NEVER forget the offer of a free beer so maybe sometime in the future; thank you for the offer! Yeah, deplanting trees and replanting them, what a thrill! But what are the trees we can see behind you on the first picture? 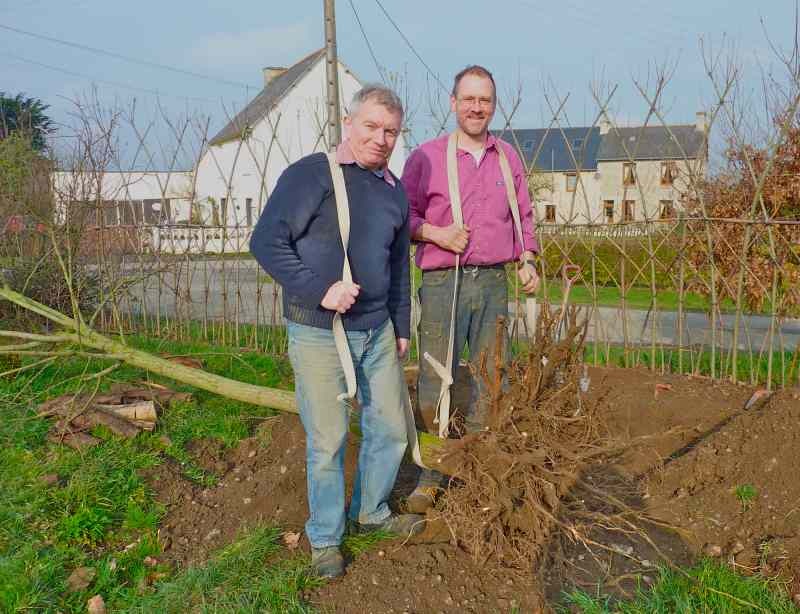 You weeded them like willows, or are they some specially shapped fruittrees? Behind the removed tree in the top picture is a woven willow hedge. It's alive but with no leaves as the photo was taken before spring but has now burst into life again. The rods (especially the uprights) are mainly Salix viminalis with a few oddities thrown in for some colour.